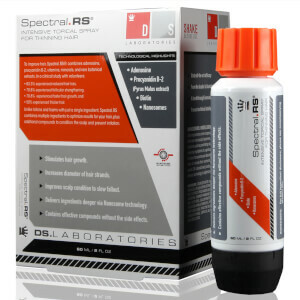 Combat signs of hair thinning with the Spectral-RS from global leaders in developing high performance personal care products, DS Laboratories; an advanced hair care that stops hair from vanishing prematurely. Formulated with pure, organic plant extracts, vitamins and minerals, the topical treatment uses nanosomic technology as an effective delivery vehicle of compounds into the scalp. Clinically proven to increase hair density, the formula contains research grade ingredients including Aminexil, an effective compound that effectively treats alopecia. The cutting-edge formula works by addressing the multiple causes that lead to thinning hair, such as perifollicular fibrosis; a condition that accompanies all hair loss whereby the collagen surrounding the root becomes rigid and tightens, thus pushing the root to the surface to fall out. Apply 14 or more sprays directly in the area of hair loss/thinning hair, twice per day. Rub in the liquid evenly over the entire area. Do not rinse. Spectral.RS® should be applied whether your hair has been washed or not. Deionised Water, Nanosomes of Ivy, Hops, and Capsicum, Diaminopyrimidine Oxide (Aminexil), Triclosan, Ethanol, Vitamin and Mineral Complex, Propylene Glycol, Piroctone Olamine, Methylparaben.